The proponents of the capitalistic economy teach that hunger will disappear from the world if the local economies will generate enough money. But the United Nation statistic say that the number of hungry people in the world is still growing even while the total amount of the world money is multiplying. 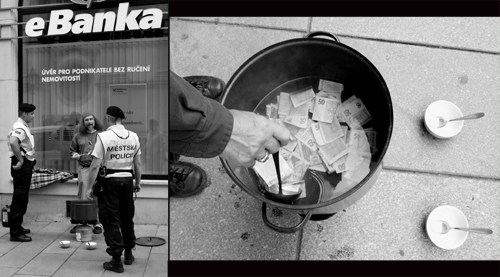 I was trying to solve this paradox by cooking a soup from some very "nutritious" money in front of the currency rates displayed in the window of the local bank. While the soup was boiling I was encouraging obviously well to do westerners to throw some money into the pot so that the soup would be even more delicious and more nutritious. At the same time I was offering a broth to the local homeless people ( who declined for the lack of the "noodles" in the broth.) The cooking place was situated in between a Christian Church and a Bank. During my statements I was stressing that our humanistic western civilization is built on the two pillars- church and bank- and that this combination is the glory of our perfect western civilization. With the ladle I pointed many times to the currency exchange rates displayed behind my back. The bank director called the Police several times and finally the special crime unit forced me to stop cooking soup for the poor.